Bush Backing Off Border Plan? President Bush apparently gave Mexican President Vicente Fox a gift to take home on Saturday: his pledge to exempt certain frequent Mexican visitors from onerous new security checks at the U.S. border. The visit by Fox to Mr. Bush's Central Texas ranch, held a year and a half after it was originally scheduled, was designed to lay past disputes to rest. But with Mr. Bush eager to boost his standing in the U.S. Hispanic community, the nation's fastest-growing voting bloc, American politics were never far from the agenda. Mr. Bush used the leaders' joint appearance before Mexican and American reporters to make clear how he sees the November election, in which he almost certainly will face Sen. John Kerry, D-Mass. "The question is who brings forth the best pro-growth policies ... who (is) best to lead this country in the war on terror," Mr. Bush said. Over intimate meals, relaxed discussions and an early-morning drive through wintertime-lush canyons to some of Mr. Bush's favorite spots on his 1,600-acre property, Mr. Bush and Fox aimed to look forward, not back. The warm ties that characterized the two leaders' relationship three years ago had soured after the Sept. 11, 2001, terrorist attacks. Mr. Bush shelved work on a migration accord coveted by Mexico; Fox abruptly backed out of a planned visit to Mr. Bush's ranch in August 2002 over a death-penalty dispute and refused to back Mr. Bush at the United Nations on an Iraq war. On Saturday, side-by-side in casual clothes and the warm March sun, horses and cows grazing placidly in a meadow behind them, the two men sought to project an air of cooperation on immigration, trade, Haiti and anti-terrorism measures. Neither publicly mentioned other divisive matters - such as the water Mexico owes the United States or a continued disagreement over Mexicans on death row in the United States - that still divide the North American neighbors. "Mexico and the United States are more than neighbors," Mr. Bush said Saturday, sprinkling Spanish throughout his remarks. "We are partners in building a safer, more democratic and more prosperous hemisphere." Still, there was very little of the effusive mutual admiration that usually features prominently in Mr. Bush's appearances with world leaders. Though immigration issues were foremost on Fox's mind, he left Texas with some new assurances but no ironclad agreements. Under the US-VISIT program, already in use at many airports and seaports, visitors from certain countries must be fingerprinted and photographed before entering the United States. When the system is expanded later this year to the busiest land entry points as well, it would ensnare the many Mexicans who regularly travel back and forth with so-called border-crossing cards. Fox said the fingerprinting and photograph requirement now won't apply for border-crossing card holders, celebrating "the news that was confirmed today with regard to visitors to the U.S. from Mexico." Fox also applauded work by the two leaders to advance a proposal Mr. Bush offered in January to give temporary visas to illegal immigrants, most from Mexico, already working in the United States. But Mr. Bush was pessimistic about the prospects for congressional passage of his temporary worker proposal - saying "there's no telling what's going to happen in an election year." Also, he said little about the border-crossing issue while his aides signaled it is far from settled. Mr. Bush told Fox in their Saturday morning meeting that he is committed to the exemption, though details still need to be worked out, White House spokesman Sean McCormack said. However, McCormack wouldn't confirm that the remaining issues were merely technical, saying the matter is extraordinarily complex, and could not offer a timetable for a final agreement. "We will work to ensure a system of safe and orderly migration," Mr. Bush said. "We're making progress." 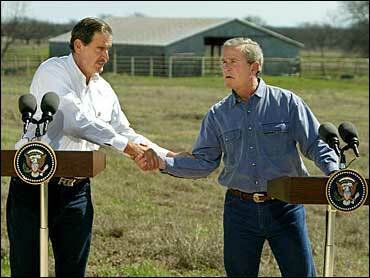 "President Bush has invited Vicente Fox back to the ranch in Crawford. An immigration proposal long-awaited by Latinos has been laid on the table. It must be an election year," said New Mexico Gov. Bill Richardson, a Democrat who has been talked about as a possible Kerry running mate. Mr. Bush defended his handling of the economy against Kerry's attacks and a new report that showed U.S. payrolls increased by only 21,000 jobs last month, about 100,000 fewer than expected. Without mentioning Kerry by name, Mr. Bush implied the Massachusetts senator would raise taxes and derail the economic improvements Mr. Bush has overseen. "Raising taxes will make it harder for people to find work," the president told reporters. Kerry, who said while campaigning only a couple hundred miles away in Houston on Saturday that Mr. Bush has left the nation in economic ruin, has called for repealing the portions of Mr. Bush's tax cut that went to wealthy taxpayers. Mr. Bush characterizes that as a tax increase. "George Bush is a walking contradiction and a walking barrel of broken promises," Kerry said. The president also didn't shrink from his campaign's use of images from the Sept. 11 attacks in his first round of campaign ads. Some victims' families have said the pictures' use for political gain is offensive. "How this administration handled that day as well as the war on terror is worthy of discussion," he said.